This year ranks among the Top 5 wettest years ever for the region, which has a lot of people asking if that means they should expect a lot of snow this winter. All big indexes point to yes. Storm Team4 predicts double the average snowfall for most of the region. After a moderate La Nina last winter, we are moving into a moderate El Nino this winter. Typically, that means colder than average temperatures and more snowfall. The amount of snow in Siberia in October helps predicting winters here. This year got off to a slow start, but snowfall has really increased in the past few weeks, which is a good sign for those who like snow and cold. Another factor is the sun. We are moving into a solar minimum, which means the sun is producing less activity. That has led to more snow in the past. In the north Pacific Ocean, the water is warmer than average south of Alaska, which will send the jet stream well to the north, allowing the jet stream to bring very cold air down to the south. Meanwhile, the El Nino pattern brings a strong southern jet, allowing areas of low pressure to move along it. When the two patterns collide, it can send a storm up the East Coast with plenty of cold air and potential for heavy snow. 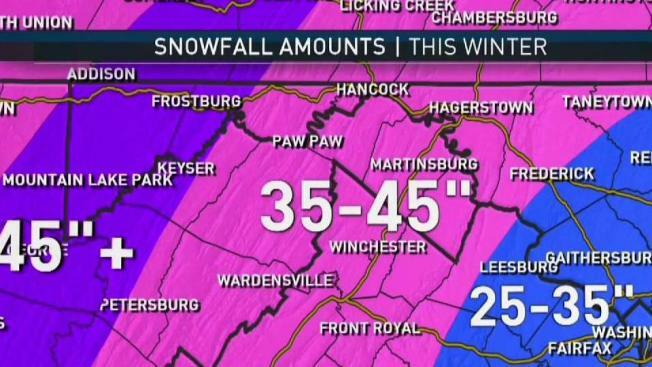 D.C. usually gets about 15 inches of snow, but Storm Team4 is predicting 25-35 inches this winter in the metro area and along Interstate 95. Expect 35-45 inches out toward Dulles International Airport and Frederick, Maryland, and even more than that further west. And there could be a storm around Christmas. As far as the temperatures, December should be about normal. January could slightly colder than normal, and much of February will be colder than normal. Late January into February look like the coldest and snowiest part of the season.